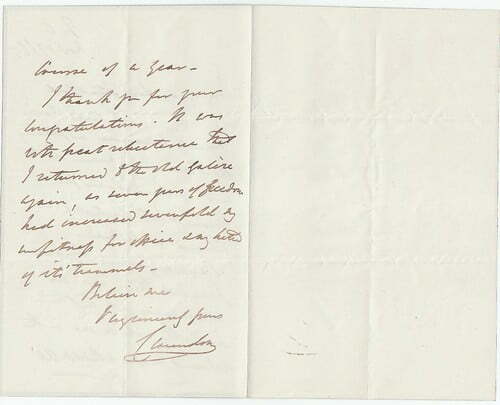 Autograph Letter Signed, to Viscount Stratford de Redcliffe (Stratford Canning, former ambassador to Constantinople) agreeing to place Mr. Brennan’s name on the list of candidates for a Student Interpretership in China or Japan. 2 pp. 7 x 4½ inches, in good condition. Foreign Office, 17 November 1865. The 4th Earl of Clarendon (1800-70), statesman, Secretary of State for Foreign Affairs from 1853.